This Historical Dictionary of U.S. 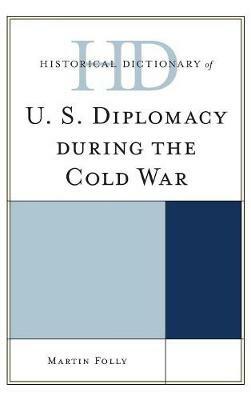 Diplomacy during the Cold War offers readers a comprehensive, accessible survey of the principal actors and events involved in the making of United States foreign policy during a crucial period in the nation's history. The Cold War saw the United States acquire superpower status, and to be closely involved in events around the globe. Foreign policy became a central issue in domestic politics. The confrontations with the Union of Soviet Socialist Republics and its allies and satellites, and with the forces of international communism dominated U.S. interactions with the world throughout this period. This book covers this turbulent period through a chronology, an introductory essay, appendixes, and an extensive bibliography. The dictionary section has over 900 cross-referenced entries on key persons, policies, events, institutions, and organizations, along with issues such as the division of Germany after World War II, the creation of the People's Republic of China, European economic recovery, communist movements in the third worlds, decolonization, the Vietnam War, and the nuclear arms race. This book is an excellent access point for students, researchers, and anyone wanting to know more about U.S. diplomacy during the cold war.